Note the notes that wrap around my hand. When you watch her read, be sure to bring paper along with your pen to avoid ink poisoning. For those inclined, here’s her remaining Book Tour. In the mean time, straight from the writer’s hand (literally), here’s some writing advice I weened from Pam Houston. 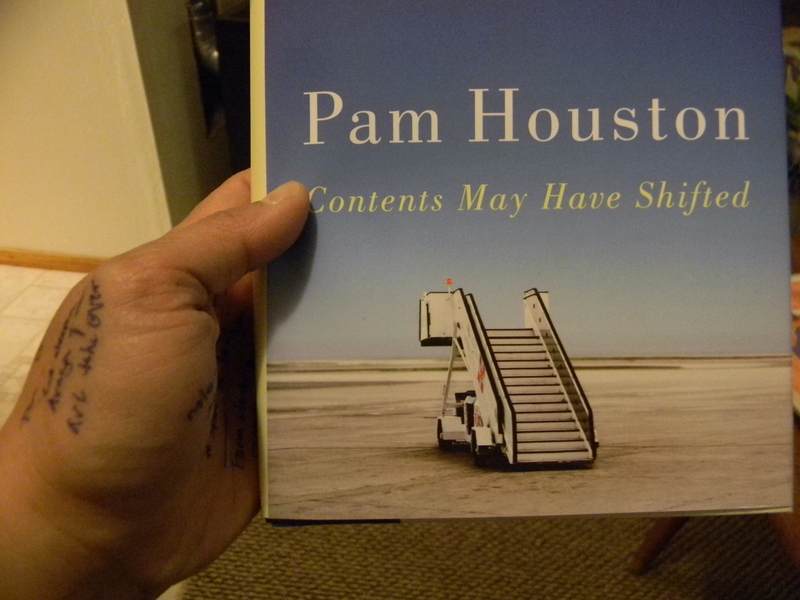 Pam Houston’s new book, Contents May Have Shifted is told in 144 vignette type stories. There are 12 different sections. Each section begins with a plane ride and is followed by 11 vignettes titled with a different location (“Madison, Wisconsin,” “Albuquerque, New Mexico,” “Fairbanks, Alaska,” etc). All in all, the book adds up to a whole lot of places that span the entire world. Though some of the locations repeat (“Davis, California,” for instance), many of them are new. One audience member wanted to know how she kept track of everything. Do you write things down, the woman asked, or do you simply remember things in such stark detail? (And believe me, when you read the book, the woman is a master at descriptions, but that is for another blog post or three..). Pam Houston answered as follows: You know that part of the plane ride when the pilot lets you know you are an hour from your destination (fifty minutes, forty minutes, the time might change, but the message is the same: prepare yourself for the impending landing)? Houston uses that announcement as a signal. While other people use the restroom (her joke), she gets out her notebook and does a “Brain Dump.” Details, facts, memories. It doesn’t have to be complete scenes, coherent thoughts, or even complete sentences. Along with various facts, her goal is to capture “all the things that glittered” at her. so now I’m bummed that I didn’t buy the book. I looked at her book tour schedule and she will be at the LA Times Festival of Books. Aren’t you going to that? You can buy her book there (and maybe a copy for me! ).